A search and rescue drone is to be trialled by a mountain rescue team in Cumbria's Lake District. Video footage it relays will be monitored by internet users looking for injured or lost climbers and walkers. Patterdale Mountain Rescue Team (MRT) leader Mike Blakey said it "taps into all the social media ways that people are using digital technology today". The University of Central Lancashire said it could be quicker, cheaper and safer than other search methods. The drone could cover an area which might take a team on the ground hours to search, said space and aerospace engineering lead Darren Ansell. "Speeding up the rescue operation can be critical particularly when injuries are severe or the weather conditions are poor," he said. On 25 July trial images from the drone will be relayed to anyone logged onto the AeroSee web application who can then click on any area where they spot an injured person. This "crowd sourced" information will be sent to the MRT, who can then send the drone for a closer look. One person alone could not review the 100 images per minute relayed by the drone. Director of the university's Media Innovation Studio Paul Egglestone said: "Drones get lots of bad press as they're usually associated with civilian casualties in military theatres. "They're just a tool and we're using AeroSee for peaceful purposes. "The unique thing about our approach is that we're inviting civic-minded people to give up 20 minutes of their time to help save a life on the mountainside. "It turns the whole drone debate on its head and encourages people to participate, wherever they are." Mr Blakey added: "The real test would be our usual conditions - out at night or in atrocious weather." 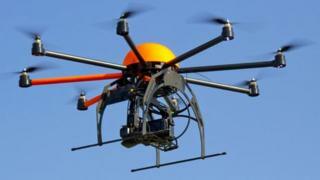 Sky high thinking: Could we all soon own a drone?